Showing 1 - 3 of 3 Products for Automatic Transmission Shift Lever Kit. The ultimate shifter for most 2,3 and 4 Speed applications with or without air or CO2 shifters! Reverse lockout feature meets NHRA/IHRA requirements. Precise gate action ensures consistency. Includes cover. Our Pro stick applications without cover! You can customize your Pro Stick application with your own cover, or with one of our Pro Stick accessories for a custom install, or if you want to shave that last ounce of weight from your racecar. Shift Lever Length (in. ): 10.150 In. 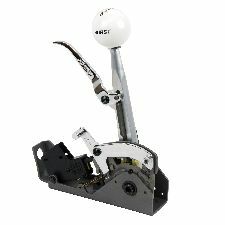 The award-winning Quarter Stick Automatic Shifter is designed to provide positive gear change control for street or racing transmission applications. Designed for 2 and 3-speed automatic transmissions in both forward and reverse valve body shift patterns Detent activation is controlled by a chrome-plated trigger contoured to fit comfortably into the driver's hand Extremely compact and lightweight for tight fit cockpit installation and weighs only 2.5 pounds Comes with factory installed neutral safety switch (back-up light switch is available separately) Controlled gate stop activation for positive feel One-hand operated, spring loaded reverse Loc/Out mechanism enables drivers to clear the reverse Loc/Out while remaining strapped in their shoulder harness belts Comes complete with hardware, 5' long shifter cable, and easy to follow installation guide Forged aluminum stick for added strength has 7/16-20 thread Optional covers (sold separately).